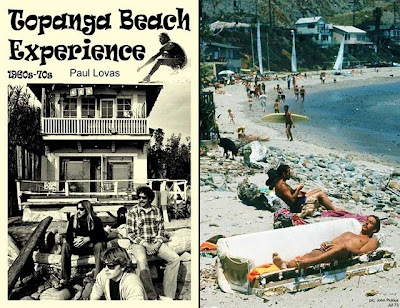 At 16, Pacific Ocean Park Pier surfer Paul Lovas moved to a beach house on a Malibu pointbreak called Topanga and discovered "the surf hang-out, groovy place to be away from LA." He and a buddy took over the house of Bear from Canned Heat. Their Venice High gym teacher lived next door and let them skip class to surf. The beach was protected by a surf gang called the Topanga Bombers. There was a preteen world-champion skateboarder, a rowdy surf-rock band, and a house full of "pirates." These were the "Cosmic Children," as Hal Jepsen, another local, nicknamed a generation in his 1970 surf film. Paul was drawn to the excitement of the beach lifestyle, where "everything was always changing," at a time when society was changing too. Keeping up was like riding its own wiggy wave, and for two decades Paul carved through the cocktails, Jacuzzis, Vietnam War, free love, and rock 'n' roll... finally wiping out when the Topanga Creek flooded in 1979 and carried his house away. Today all the houses are gone, and Topanga is a State Beach, but the "wild life" is preserved in Paul's Topanga Beach Experience.